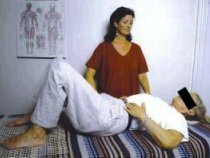 I am an experienced Alexander Technique teacher based in Stoke Newington, London N16, having qualified in 1987. Whilst I offer 'pure' Alexander lessons and Workshops, my professional experience and background in Ballet, Psychology and Stress Management inform my work. And I love teaching the AT. My first career was in Ballet. I trained at the Royal Ballet School then performed for a number of years, mainly with the Sadlers Wells Opera Ballet (ENO). I have an ACSET 2 Certificate for Teaching Adults, a BA (Hons) in Psychology, a PG Dip in Psychology and Health, plus a Diploma in Psychosynthesis Counselling and Therapy. Of course I have also qualified as an Alexander teacher. I first had Alexander Technique lessons whilst at college as a mature student. I really enjoyed my lessons and found the AT helped me manage my stress levels and to improve my concentration so that I started getting higher marks at college! My AT lessons also helped sort out an old back injury that I'd had since my teens and I decided to go on to qualify as a Teacher of the Alexander Technique. Marjorie Barlow, Margaret Goldie, Patrick Macdonald, Tony Spawforth and Peggy Williams. My teaching has included Courses and Workshops in the Alexander Technique and in Stress Management in my own practise, in Adult Education Colleges and for the corporate sector. My main focus now is the Alexander Technique. I have taught the Alexander Technique at the Royal College of Music, in Crete, Cyprus and on Ernest Read Music Association and LSO Summer Schools. I have participated as one of the Alexander Teachers in a research trial which compared the effectiveness of the Alexander Technique, Massage and a GP Exercise Programme, as treatments for patients with recurrent and chronic back pain. The research was designed by Southampton University and funded by the MRC and published in the BMJ (Aug 2008). I have also been teaching at the London Centre for Alexander Teaching and Training, LCATT, one of the STAT recognised Alexander Technique Teacher Training Schools, since 2009. I am pleased to say that at least seven of my private AT pupils went on to train at LCATT and other training courses and have now qualified as Alexander teachers. As well as following STAT's code of conduct, I aim to work in a way that protects the environment through using FSC and recycled paper products and use a Green Energy supplier. The main charities that my work supports are UNICEF's Children's Emergency Fund, and the Woodland Trust's Carbon Capture programme. I am also very actively involved with local community groups. If you are interested in finding out more about my Alexander Technique lessons, workshops or Gift Vouchers, please contact me via my enquiry form.